With Porsche, life is not just fast but colourful, too. In short, the Porsche 911 simply looks good in everything. Whether pure white, refined black or strident yellow. Cheeky orange or rich green, blazing red or dignified blue. Even coffee brown suits it – the sportscar model is a perfect fashion model, made for the car catwalk. Never does it look embarrassing; nothing seems unsuitable. On the contrary, particularly bold colours make a statement which should always reflect the driver’s self-confidence. Often it is just those paint finishes that generate the most passionate discussion. Later exuding a certain charm and is in hot demand with collectors. Which means: If you discover a colourful gem on these pages, there is only thing one for it: buy! Every time and every generation has its colours. Hardly any other motor vehicle reflects this maxim so enduringly as the 911. In this respect it is a clear trendsetter. Like a first-born child, it has fought for its rights – the freedom to wear unconventional paint colours – and then passed them on to its younger sibling models like the 944 and 928, which now enjoy such colours as a matter of course. Before the 911, everything seemed to have been grey. If you think back to the 50s and early 60s, the images that come to mind are films and television, pictures and newspapers in black and white. Of course that is our memory playing tricks on us, as it is in no way infallible, instead giving events new colours – or indeed the opposite. One thing, however, is certain: on August 25, 1967 at 10:57 a.m., when German colour television made its triumphant début only shortly after the sportscar icon made its own, the 911 had been shooting around as a bright blur through town and country for only two years. So there was hardly any time for it to be immortalised in black and white. 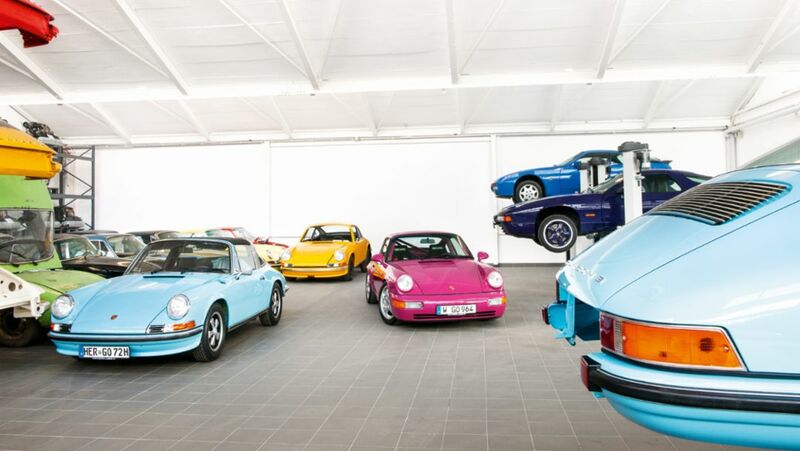 And this means memories of the all-time classic Porsche vehicles are almost exclusively in colour. And what colour! Slate Grey, Ruby Red, Sky Blue, Light Ivory, Champagne Yellow, Iris Green and Signal Red – in addition to seven standard colours, four special paint finishes were also available when the model was introduced, these being Dolphin Grey, Togo Brown, Bali Blue and Black. The first prototype of the 911, the 901/01 of 1962, meanwhile, was a clean, simple white. By 1966, the colour spectrum already encompassed 30 special colours, including for the first time four metallic paints: Dark Red Metallic, Blue Metallic, Silver Metallic and Dark Green Metallic. The new blaze of colour on the streets even triggered public debate. England’s police force made an official plea for all vehicles to be white. “Auto, Motor and Sport” magazine suggested prescribing signal colours like yellow, red and orange for fast cars. Black and especially grey, on the other hand, were suddenly considered unsafe. The British magazine “Automobile Engineer” expressed concern that a vehicle painted in such a colour could “easily” be developed into a “camouflaged weapon”. Fortunately, the automotive world was spared from such legally imposed monotony. Still in the 60s, colours as bold and powerful as Canary Yellow, Blood Orange, Iris Green, the light Pastel Blue and the dark Albert Blue set the beat. As if the Porsche designers wanted to take up the rallying cry of the rebellious student movement and chase away the “mustiness of a thousand years” from the streets. However, it also worked the other way round: More muted tones such as Bahama Yellow, the milk chocolate shade of Sepia Brown and the elegant Light Ivory showed off the delicate side of the original 911. The rebellion at the universities was followed the psychedelic late 60s and 70s. Rock musicians lost themselves in endless instrumental pieces, the world was astounded by the wild freedom of Woodstock.Flowing batik robes and diverse ways of life in hand-painted VW camper vans. The kaleidoscope of Porsche colours continued to grow. Louder shades such as the particularly frog-like Viper Green brought accents that were impossible to miss. Thequieter Gemini Blue Metallic came with a delicate touch. At the same time, there emerged classics such as the charismatic Gulf Blue, derived from the world of racing. Alongside this, a completely new trend was developing, influenced by the epoch-making Carrera RS 2.7 in 1972. While the preferred colour for the legendary lightweight 911 was Grand Prix White as it rolled off the forecourt, it had two distinguishing characteristics. In addition to the “ducktail” rear spoiler, the vehicle featured “Carrera” lettering along its flanks – available in Blue, Red, Green and Black as well as colour-matched to the painted wheel centre. Following the model change from the F to the G model, colours on offer became somewhat calmer from 1975. Darker, more sedate tones came increasingly to the forefront, with shrill, candy-style paint finishes finding less and less appreciation. Understatement and a cautious view towards resale value supplanted the extrovert appearance. 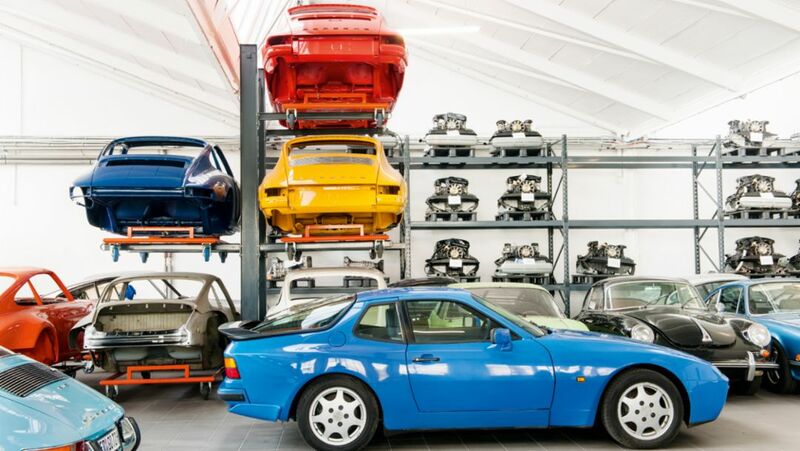 The colour spectrum of the 911 now needed to suit the four-cylinder 924 and the large Gran Turismo model 928. Taste is a fickle friend. The next paradigm shift swept into Europe from the USA in the mid-80s and conquered our screens in the person of “Sonny” Crockett and Ricardo Tubbs. With its garish neon design, “Miami Vice” established a whole new look and made marshmallow pastel tones just as popular as Ray Ban “Wayfarer” sunglasses or jackets worn over T-shirts. Soon enough, this also had an effect on the colour palette of the German sportscar specialist. The three main protagonists in this story demonstrate this very clearly. A 944 S2 in Maritime Blue is just as eye-catching as the pink-washed Star Ruby 911 Carrera RS 964. As well as the powerful 928 GTS wrapped in Amaranth Violet. A legitimate predecessor to the modern GT3 and GT3 RS models, the RS also provided a prime example of the fresh confidence with colour that Porsche has displayed time and again ever since. The 997 GT3 RS in Acid Green thus made just as lasting an impression as the model in Orange Met, and the 991 GT3 RS looked even more impressive in Lava Orange and Ultraviolet. And for anyone who thought they had seen it all, as history supposedly repeats itself, Porsche had a surprise in store in 2009. The 911 special edition Sport Classic was released in a deep grey bearing the name of the model, looking at first glance more like a prime coat. The 250 units produced were sold out within 48 hours. Once again, proof that a 911 simply looks good in everything. The same is true across the board for all other Porsche sportscars. Text first published in the magazine “Porsche Klassik 10”.